Timers are an inexpensive way to save money and electricity--they aren't just for empty houses anymore; today's high-tech dimmable lighting needs high-tech dimmer switches to match. Give your memory and your utility bill a break by using smart controls and switches throughout the house and even outside. Go ahead and leave the light on. We've got your back. We all waste a lot of energy by leaving things turned on when we're done using them. Most of the time it's simple absent-mindedness: we forget to switch the light off in the closet and come home that night to find that bulb still glowing. But let's face it, you've got much better things to do than scour the house for appliances left on. When you're pulling out of the driveway and notice the upstairs hall light is still on, it seems like an equal waste of energy to walk back up and turn it off. Luckily there's a whole slew of simple technology--timers, motion sensors, controls and switches--that can save you time, money and needless hassle while helping out the planet to boot. Let's start with that closet (or the bathroom, or the kitchen...Really anywhere you might leave on an overhead light or a ceiling fan). There are a couple types of smart light switches, basically divided into timers and motion sensors, that make so much sense Thomas Edison should have thought of them. You install them onto the wall, right where your light switch is now. They're not obtrusive, ugly, or complicated, and they can save you a bunch of money on your electric bill by automatically switching off when nobody's in the room. The simplest and least expensive option is the Leviton Electronic 30-Minute Timer Switch, whose name is a little misleading just because you're not actually limited to 30-minute intervals. It has buttons for 5, 10, 15 or 30 minutes; when you walk into the room you just press the button for however long you think you'll be in the room. There's a small light that flashes two minutes before the light goes off to give you a fair warning, and you can also deactivate the timer with the press of a button if you know you'll be in the room for longer, so you won't have to keep getting up to press the half-hour button. 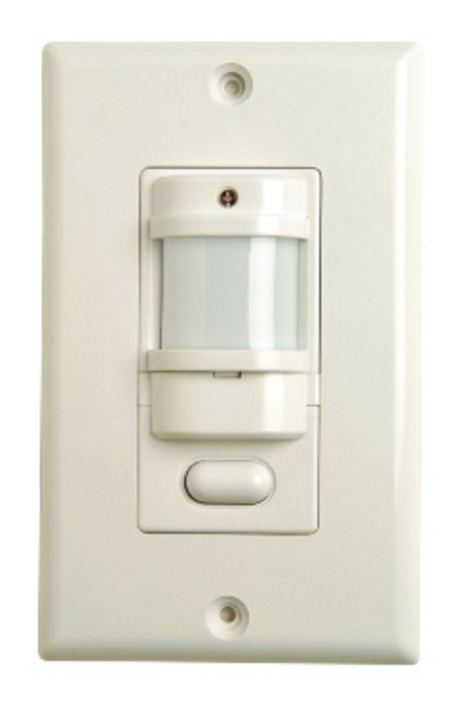 Another option is the Hubbell Motion-Sensing Light Switch, which is also on a timer set to your specifications, but which requires no button-pressing at all. You just walk into the room and the light turns on; after you leave the room, it even waits a few minutes before turning off (just in case you're coming back). So smart. Though not switches, properly speaking, we thought it useful to include here three bathroom fans that we carry that have "smart" controls built in. The Panasonic WhisperGreen SmartAction Fan has a built-in motion sensor, so you don't need to worry about purchasing a separate wall switch to make it smart...It also happens to be a super energy efficient, powerful, whisper quiet, just plain awesome fan. We also carry a humidity sensing fan from Broan, as well as the Broan humidity sensing fan/light combo, which comes with an energy efficient fluorescent bulb. Both of these fans actually detect moisture at the ceiling (where moisture collects, and where the fans live), quietly turn on to take care of it and turn off when the moisture has been eradicated. Now that's smart. Of course lights aren't the only things you inadvertently leave turned on. Your air conditioner, space heater and humidifier sit there devouring watts all day long. Fortunately, a new generation of timers lets you control everything from the coffee maker to the hot tub. The timer plugs into the wall, you plug just about anything into it, and pick your times on a 24-hour schedule. You could set your radio to turn on just before you walk in the front door after work, for example, or get your space heater cranking a half hour before you get up so you don't get cold feet. Bear in mind the distinction between "heavy duty" timers--which have enough voltage capacity to handle something like an air conditioner--and the timers meant for lighter electric loads. The Intermatic Lamp Timer is an indoor timer that works for lamps and small appliances, has up to 24 on/off settings per day, and at under ten bucks can't be beat. For heavier electrical loads, Intermatic also makes a Heavy-Duty 120V Appliance Timer, which has up to 3 daily on/off settings and can be used for bigger appliances--heaters, air conditioners etc. You just turn the green dials to the times you want your appliance to turn on, and the red dials to turn it off anytime throughout the day. The Globe Digital Heavy-Duty Timer is pretty similar, but works digitally so you can store up to 20 on/off settings throughout the day, and comes with a backup battery so you won't have to reset it if the power goes out or if it gets unplugged. There's a whole category of gadgets meant to tackle your outdoor energy drains, too--you know, those things you tend not to think about too much, and which, are probably costing you an arm and a leg every month. There's a good chance you have outdoor lights, so let's start there: the Watt Stopper Outdoor Motion Sensoruses PIR (passive infrared) technology to sense when people or cars approach and when they've gone away, and turns your light on and off accordingly. You can customize the delay setting, too, so the lights turn off anywhere from a few seconds up to four hours after the passer-by has passed by. Another neat option is the Intermatic Screw-In Light Sensor, which instead of sensing things approaching senses when it's light and when it's dark. You just screw it into the light socket, and screw your bulb into it, and your light will turn on when it gets dark and turn off when it gets light. Makes sense. You don't have to choose between fumbling for your keys in the dark and leaving the porch light on all day. For outdoor appliances other than lights--the hot tub, say, or the radio your garden plants enjoy so much--your best bet is the Intermatic Outdoor Mechanical Timer. It works just like the timers above, but it's built to withstand weather anywhere from -40 to 104 degrees Fahrenheit, rain or shine, and comes with a 15-inch power cord for a little more mobility. It's suitable for heavier electrical loads and has a ground plug and manual override, so it's fine for something like a pool pump. You can use this timer for lights too, of course. It just has a little more versatility. Just about anything that uses electricity can be hooked up to one of these devices and start saving you time, energy, and cash. Find the one that will work best for you. Still not sure? Contact Energy Circle. We'd be happy to help.